Software engineering and network engineering. 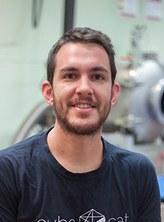 Joan received his MSc in Telecommunications Engineering from Technical University of Catalonia (Spain) and his MSc in Aerospace Engineering from ISAE Supaero (France) in June 2016. 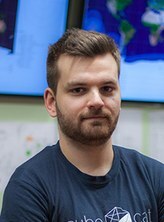 He joined UPC's NanoSat Lab in 2017 as member of the 3Cat-4 project. He is currently with the Department of Network Engineering, where he is pursuing his doctoral degree. His research interests include embedded networks, satellite networks and Internet of Things. Software engineering and system integration. 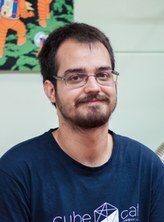 Carles received his MSc in Electronics Engineering from Technical University of Catalonia in September 2014. He joined UPC's NanoSat Lab in 2012 first as a senior student and later as a graduate researcher. He is currently with the Department of Electronics Engineering, where he is pursuing his doctoral degree. He led the software engineering team of the 3Cat-1, designed its flight software and supervised the ground segment software development. 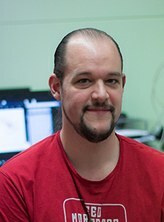 He was also an active member of the "Android Beyond the Stratosphere" team since 2013, and has authored several academic works in the areas of software architecture design and mission planning systems for nano-satellites. His research interests include task planning algorithms and systems, distributed satellite systems and spacecraft autonomy. Joan Francesc Muñoz was born in Mallorca in 1992. He obtained the MSc in Telecommunications Engineering by the Technial University of Catalonia – UPC BarcelonaTech and is currently pursuing a doctoral degree. Joan F. joined the NanoSat Lab in 2013 as a Communications System Engineer for the 3Cat-1 mission and has been involved in all its missions ever since. He participated in ESA's BEXUS 19 campaign, with a proof of concept of the GNSS-R spaceborne technology integrated in 3Cat-2. 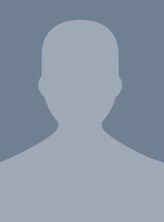 He also led the OBDH software design and development and was part of the Comms. subsystem team for 3Cat-2. He is now the lead software engineer of 3Cat-4. Lara Fernandez was born in Barcelona in 1994. She received her B.Sc. in Telecommunications Engineering by the Univeristat Politècnica de Catalunya – UPC BarcelonaTech in 2017 and is currently pursuing a M.Sc. in Telecommunications Engineering. 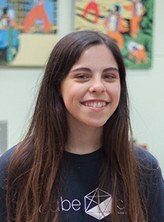 Lara joined NanoSat Lab in 2016 as a Payload Hardware Engineer for the 3Cat-NXT platform. She is currently leading both the payload antenna design and the GNSS-R and radiometer payload software for the 3Cat-4 mission. 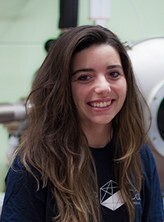 Additionally, she is involved in the FSSCat project working in the development of a multispectral payload. David received his B.Sc. in Telecommunications Systems Engineering by the Technical University of Catalonia - UPC BarcelonaTech in 2017 and is pursuing his M.Sc. in Telecommunications Engineering with specialization in Antennas, Microwaves and Photonics for Communications and Earth Observation. He joined the NanoSat Lab as a research assistant for the ONION project in 2016. He is currently with the department of Signal Theory and Communications contributing to the development of a Distributed Satellite Simulator. Oriol is currently pursuing his B.Sc. in Industrial Technologies Engineering from the Technical University of Catalonia (ETSEIB, Barcelona). 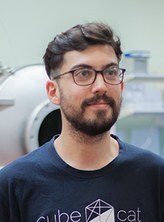 Born in Barcelona in 1995, after working as a collaborator at ETSEIB Motorsport in the electronic department, he joined UPC's NanoSat Lab in 2018. He is currently addressing the design of a test and verification software tool to allow the analysis of the deployable helix antenna for the 3Cat-4 mission (Nadir Antenna Deployment System, NADS). Andrea was born in A Coruña (Spain) in 1993. She obtained her B.Sc. in Industrial Engineering by the University of Vigo and is currently pursuing her M.Sc. in Industrial Engineering, mechanics specialization from UPC BarcelonaTech. She joined UPC's NanoSat Lab as a mechanical engineer for the 3Cat-4 in June 2017. She previously collaborated with Engineering Without Borders where she could apply engineering concepts and skills for human development and cooperation projects. Her research interests include CFD (computational fluid mechanics), spacecraft mechanics and design, and deployment systems. Marc was born in Berga in 1994. He is currently pursuing his B.Sc. in Electronics Engineering by the Technial University of Catalonia – UPC BarcelonaTech. 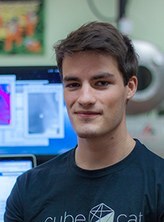 Marc joined the NanoSat Lab in 2018 as an undergraduate student and is currently contributing to the 3Cat-4 mission as part of his B.Sc. thesis. His tasks include the design and implementation of support, test and verification equipment and the development of flight-hardware for the satellite bus. Carlos obtained his BSc in Aeronavigation Engineering by the Technical University of Catalonia - UPC BarcelonaTech in September 2017. He joined the NanoSat Lab in July 2017 as an AOCS engineer for the 3Cat-4 mission, designing and implementing the Attitude Determination and Control algorithms and developing an AOCS simulator to validate them. His research interest includes GNC (Guidance, Navigation and Control), autonomous vehicle dynamics and aerothermodynamics.